Gooood Morning! Is there anything better than a sweet and yummy bread to start the day and the weekend? Imagine a carrot cake, banana bread and oven baked oats all-in-one delicious and nutritious bread! And it is gluten free and vegan! This how I deal with crucial choices in the morning!!! 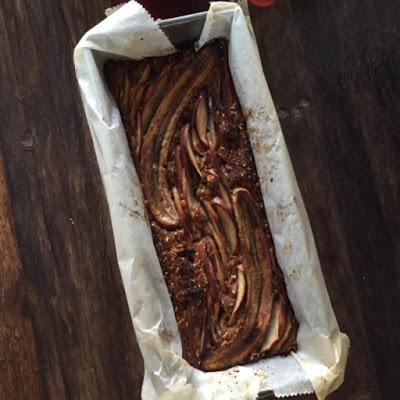 I do not like to choose and not be able to enjoy all the tastes I like… This is how I came up with this recipe,… I was not able to choose if I was going to cook my oven baked oats, a banana bread or carrot cake…. so I decided to mix everything together, and….tadaaaammm! I also opted for a large quantity bread loaf in order to be able to freeze and save some for the next days! Turn on the oven to 180C degrees. 1/ First make an Earl Grey tea in a large bowl and soak the raisins, apricots and figs in it. Leave it apart while you proceed with the rest of the recipe! 2/ Grate the carrots and 1 of the 2 apples. Add 1 banana, mashed and the ginger. Mix the veggies in a large bowl. 3/ Add the almond flour, the oats, seeds and walnuts. Feel free to swap the seeds and walnuts for any other nuts you have in hand. I think hazelnuts, pecan and walnuts suits well with the veggies mix, butthe limit is your imagination and what is available for you! 4/ Add now the cinnamon and baking soda, mix well again. Then get your flaxseeds in water and crushed it in a blender to get like a thick paste.Add it to the batter. 5/ At that point, your batter is still very dry. Pour the raisin and cut the apricots and figs in small pieces. Pour the whole tea where the fruits were soaking in the batter and you will get a nice smooth texture! 6/ Line some baking paper in a loaf mold and pour the batter in. Then, add the 2nd banana and 2nd apple sliced on top. Press them a bit to be sure they get in to the batter. I added a small table spoon of coconut oil and maple syrup on top to be sure the fruits will not burn during the baking. 7/ This bread is quite thick if you cook it in 1 mold, and it took like 50min in total. I even went a bit up till 200C degrees the last 20min. Then I let it cool in the oven. If you divide the batter or even cook it in muffins mold, then it should be quite shorter to cook. 8/ The result is a dense and moist bread, quite sweet and really flavorful and filling. I served it with my raspberries jam and it was a great balance mix actually as the sour of the raspberries counter balance the sweetness of the bread. Slice the bread in thick slices and freeze what you cannot not eat in the next 5 days. then you can get a slice of heaven out of the freezer any morning you need a good breakfast on the go!